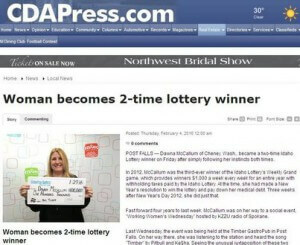 Idaho Woman Has Won The Lottery Twice! Considering the odds of winning top lottery prizes, it is no wonder that many of us are still waiting for our lucky break. But some people like Dawna McCallum of Cheney, Washington seems to be able to either will herself to win or read subtle hints. In 2012, she made a New Year’s resolution to win the lottery so she could clear her debts. Three days later she won $1,000 a week for a year from Idaho Lottery’s Weekly Grand game. Just last week she again found herself in the winner’s circle. She was on her way to an event to be held at a place called Timber Gastro Pub when she heard the song “Timber” on the radio. This prompted her to buy Big Timber scratch cards and won the top prize of $100,000. How is that for luck?